Stylish, Well Appointed and Fuel-ishly Frugal, the Mazda CX-5 Grabs the hearts of drivers with it’s quiet cabin and Dynamic Handling. 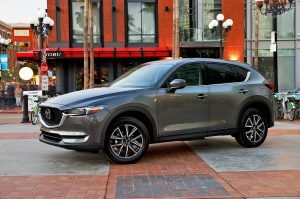 No other vehicle near it’s class offers the Safety Appointments, Personalized Driver Settings and Class-above ride that the Mazda CX-5 delivers. One reason the Mazda CX-5 handles like a sports car is it’s DNA including it’s electronic steering and handling geometry. Even the employment of SKYAVTIV® G-Vectoring making transitions through turns even smoother. One look inside the Mazda CX-5 it’s easy to appreciate the upscale materials used through-out. Soft touch surfaces and thoughtful design making it elegant and ergonomic for the driver and passengers . Car and Driver calls the Mazda CX-9, “the successul blend of zoom-zoom and room-room”. 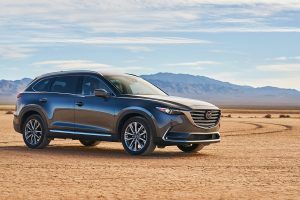 Mazda has long been known as the driving enthusiast auto brand and Mazda’s flagship, the 2018 Mazda CX-9, lives up to the name. While other car makers have built people movers, Mazda has created a great looking athletic handing Luxury suv that’s a thrill to drive and offers all the safety features and amenities a driver could ask for, like Radar Cruise Control, Auto High Beams , Auto Emergency Braking, Heads-up Display that includes Navigation, Speed Warning and Blind Spot/Cross Traffic Alert and so much more. There’s even no less than 4 USB outlets to keep everyone in your vehicle powered and connected. Mazda’s G-Vectoring Control, a system that reduces engine torque imperceptibly as the vehicle enters a corner to help improve cornering stability and provide smoother cornering transitions, is now also standard.